Carbon Ocean Yachts provide bespoke solutions from individual custom-made parts to entire boat build and project management. The highly experienced, motivated team have worked on state of the art projects including: The America's Cup, Volvo Ocean Race, Maxi Yacht, Gunboat and TP52 and Class40. 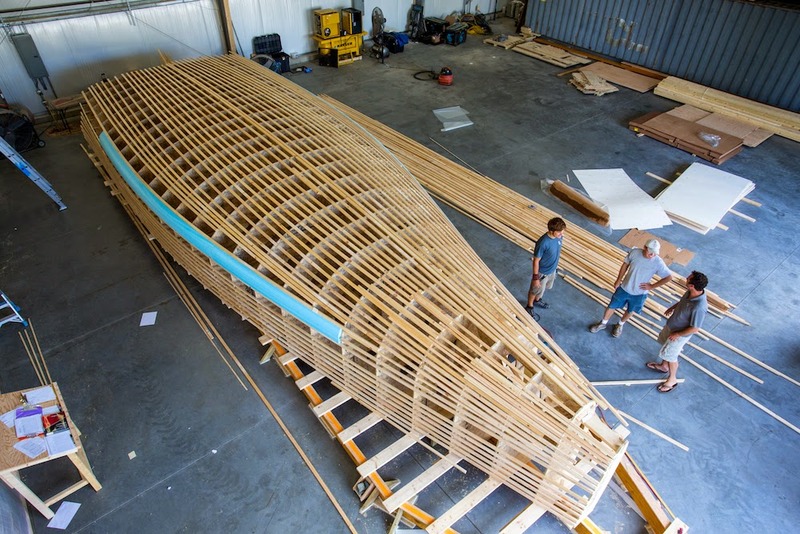 Carbon Ocean Yachts, Bristol, Rhode Island, USA have started to build a new Owen Clarke Design Class40 for Energy Freedom Ocean Racing. The design team includes Clay Oliver, engineering by PURE and weather modelling data from Chris Bedford. UK designers, OCD and US based America's Cup designer, Clay Oliver have been working together on a hull development program spanning many months and have eventually arrived at a max. beam design with lines that are unique in the class. Sail wardrobe, ballast tank positions and appendages have all been reviewed on the back of the weather and course data developed during the hull design but the finished design is still work in progress for the client, project and design team. COY is building the Class 40 in Bristol, Rhode Island and is close to completing the male plug, which will produce the carbon female mould. The hull shell construction drawings have been delivered by PURE, the engineers responsible for Team New Zealand’s last and future AC 72 America's Cup challenger. As part of the weather profiling for the yacht OCD used the same software utilised in their larger IMOCA Open 60’s to run computer simulations of design candidates on courses such as the Atlantic Cup and Bermuda Races. Using high resolution weather data provided by Massachusetts based weather forecaster Chris Bedford. Comparing their new designs against existing Class40s whose performance was used as a benchmark and modelling races as far back as 2000. The results of the simulations showed the new design was faster than the current generation of yachts, in the vast majority of conditions. Lead designer, Merfyn Owen puts his expectations for the latest Class 40 in North America in perspective. “We expect some real innovation and quality in the build from Carbon Ocean Yachts and I’m sure it will be the quickest boat on ‘paper’. However, history tells us that those with current boats need not despair! Wise sailors know and my experience of racing in the class in the US, for the last five years, tells me that especially in short-handed sailing, once the hull gets wet; experience, local knowledge, preparation and good old time on the water are all great levellers. All Rights Reserved: Carbon Ocean Yachts. Simple theme. Powered by Blogger.